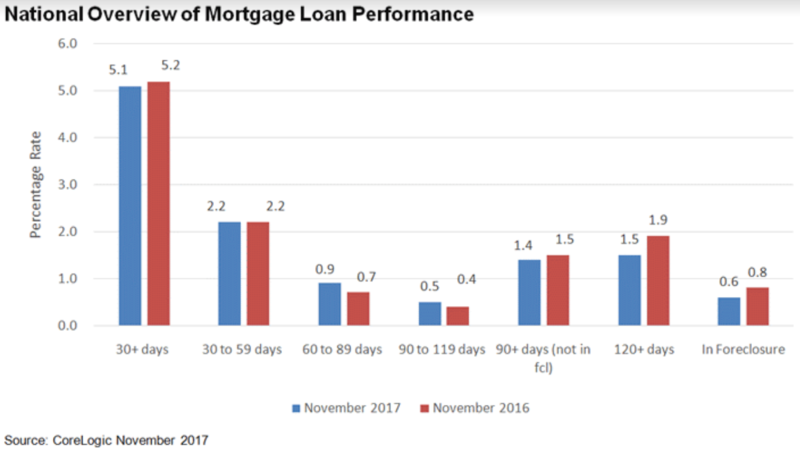 Last fall's hurricanes again dominate the CoreLogic November Loan Performance Insights Report, although the nature of the storms' influence has changed. The company says that the U.S. mortgage delinquency rate was down 0.1 percent from the previous November, as fewer loans transitioned from current to an early non-current stage, but serious delinquencies spiked in the storm areas. The national delinquency rate was down 0.1 percent from November 2016, to 5.1 percent. That rate includes all loans that were 30 or more days past due, including those in foreclosure. Early delinquencies, those 30 to 59 days past due, represented 2.2 percent of all mortgages, down 0.1 point from October and unchanged from a year earlier. The share of mortgages that were 60-89 days past due in November 2017 was 0.9 percent, unchanged from October 2017 and up from 0.7 percent in November 2016. The serious delinquency rate, reflecting loans 90 days or more past due, was 2 percent in November 2017, up from 1.9 percent in October 2017 and down from 2.3 percent in November 2016. Prior to November 2017, the serious delinquency rate had held steady for five consecutive months at 1.9 percent - the lowest level for any month since October 2007 when it was also 1.9 percent. The share of mortgages that transitioned from current to 30 days past due was 1 percent in November 2017, down from 1.1 percent in October 2017 and unchanged from 1 percent in November 2016. As of November 2017, the foreclosure inventory rate, which measures the share of mortgages in some stage of the foreclosure process, was 0.6 percent, and had held steady at that rate for four months. The 0.6 percent rate was the lowest since June 2007, when it was also 0.6 percent and was also the lowest for any November since 2006. The foreclosure inventory was 0.8 percent in November 2016. The picture was quite different in Florida and Texas, the two states hit hardest by Hurricane Irma and Hurricane Harvey respectively in September and October. The overall delinquency rate in Florida was 9.9 percent compared to 6.6 percent in November 2016 and the serious delinquency rate rose 0.7 percent to 3.9 percent. In Texas, where only a small but heavily populated part of the state was hit, the delinquency rate rose from 5.6 percent to 6.7 percent year-over-year and serious delinquencies increased from 1.9 percent to 2.5 percent. "The effects of Hurricanes Harvey, Irma and Maria appear clearly in our mortgage delinquency report," said Dr. Frank Nothaft, chief economist for CoreLogic. "Serious delinquency rates are up sharply in Texas and Florida compared with a year ago, while lower in all other states except Alaska. In Puerto Rico, the serious delinquency rate jumped to 6.3 percent in November, up 2.7 percentage points compared with a year before. In the Miami metropolitan area, serious delinquency was up more than one-third from one year earlier to 5.1 percent, and it more than doubled to 4.6 percent in the Houston area." "Transition rates for 60-day and 90-day delinquency, while stable across most of the country, were up sharply in many areas impacted by the 2017 hurricanes," said Frank Martell, president and CEO of CoreLogic. "In many of the harder-hit regions, such as the Houston and Miami metropolitan areas, housing stock availability has taken a hit as many homes were damaged and are no longer habitable. As a result, we expect to see further upward pressure on prices and rents for habitable homes, which will continue to erode affordability."